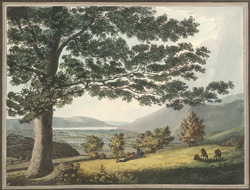 View of the vale of Keswick in Cumbria by I. Thornton. The Vale of Keswick is surrounded by hills such as Walla, Bleaberry, the Coledale Fells and Skiddaw. The vale is situated at the northern end of the lake of Derwent Water.From this location the hills and mountains can be scaled with relative ease and it was its location at the base of the mountain that made Keswick popular with tourists.